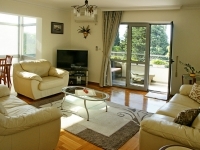 Spacious, quiet, exceptionally comfortable 2 bedroom family apartment in Budva. Comfortable 2 bedrooms apartment in Budva, house is located in a quiet settlement Babin do – in 15 minutes walking distance from local beaches. Enjoying a quiet location in Mediterranean greenery of its own garden it is ideally suitable for a family holiday. Modernly equipped apartment Katarina is located close to historical core of Budva – area with numerous shops, markets, restaurants, cafes, banks…, but at the same time enough away from the crowds and noise of the most popular Montenegrin resort, where you can enjoy your holiday. This apartment covers an area of 60m² and it is comfortable for accommodation of 4 persons. Spacious rooms with modern amenities, equipped with air conditioning, flat screen TV, DVD, Internet, washer machine… Each apartment has its own fully equipped kitchen. You choose whether to enjoy your own home cooking or try Montenegrin national cuisine in one of the myriad of restaurants on Montenegrin coast.